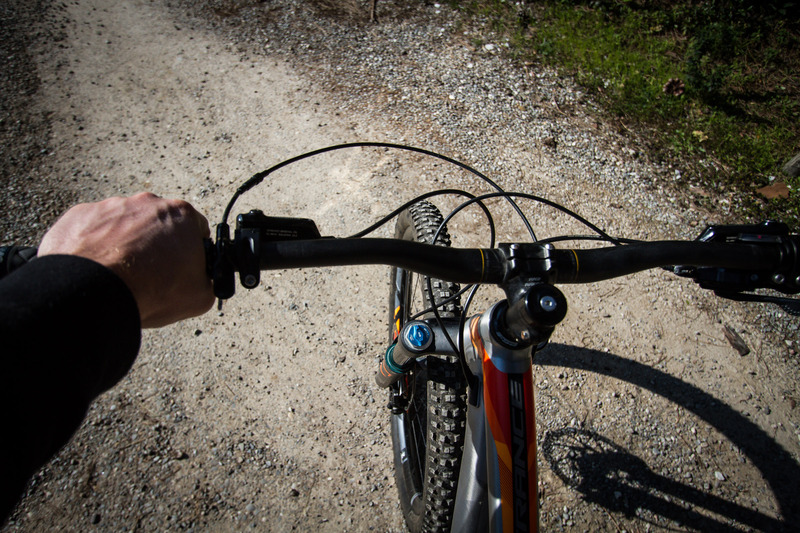 With the bike racing season almost upon us, the first race of the Toscano Enduro Series will be taking place in Castiglione della Pescaia, close to Punta Ala Trail Center. We thought it would be an ideal opportunity to give our chosen race bike, a Giant Trance, a once over and make sure it is ready for its first race of the season. 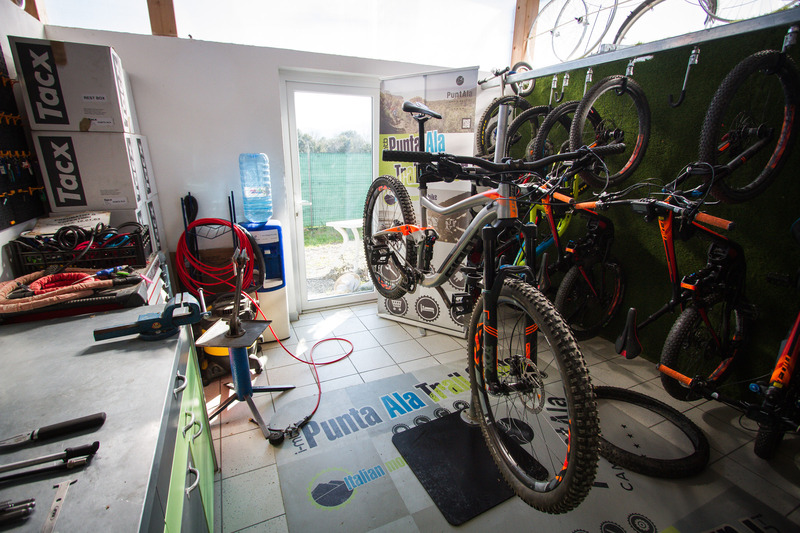 A Giant Trance enduro bike in the stand at Punta Ala Trail Center’s Bike Center shop. 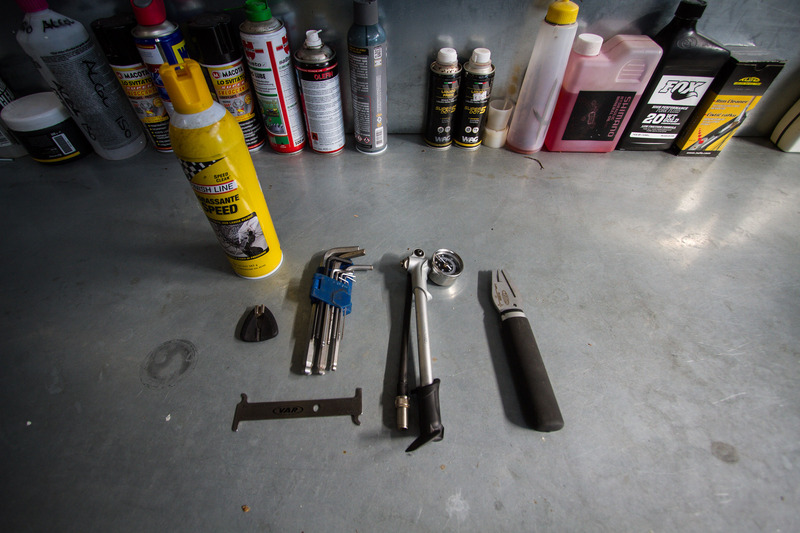 If you generally maintain your bike well there is no need for a complete strip and rebuild. We followed a pretty comprehensive plan and checked each detail of our bike. The whole procedure takes about 1-2 hours and leaves your bike race ready. 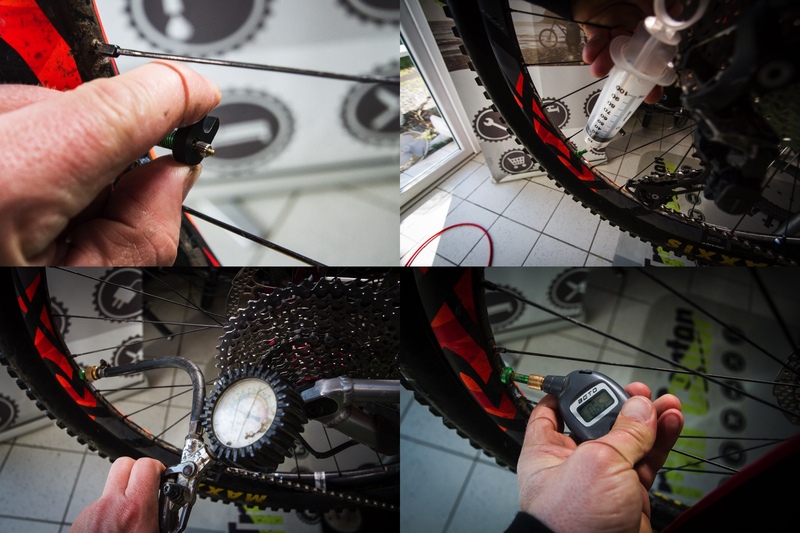 We have access for this tech corner to a fully equipped repair shop with all the tools, but it is surprising that you only need a few basic tools to check over the bike. We have some specialist tools as well, for those very specific checks, if you are planning to race we recommend you own these tools anyway. Allen Keys, a shock pump, a disc straightener, a chain check tool, and a spoke key, also we used a bit of cleaning liquid for brakes. A Torque wrench, this is a very important tool for all budding racers to own. Over-tightening bolts can be as bad as under-tightening, risking damaging parts. 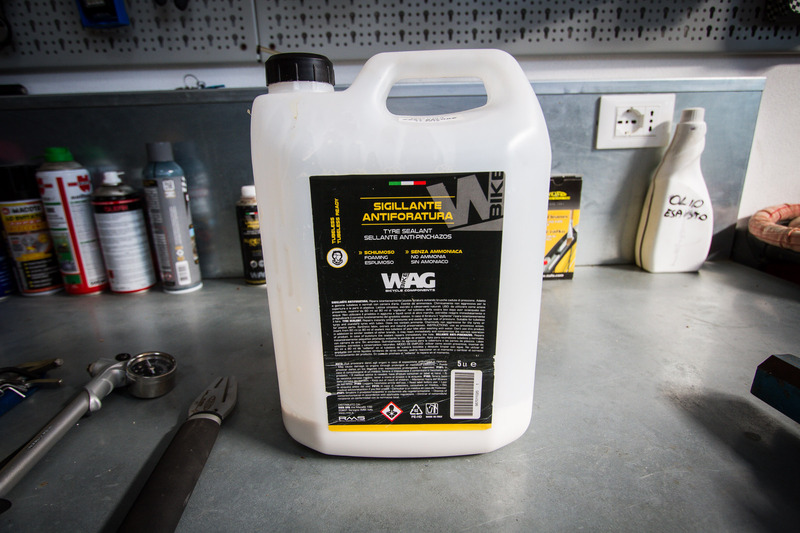 Tyre sealant and lots of it is a very valuable item to own. At about 80 euros for a big pot, it gives you the ability to keep all your tyres running properly and switch out without worrying about transferring liquid into the new tyre. 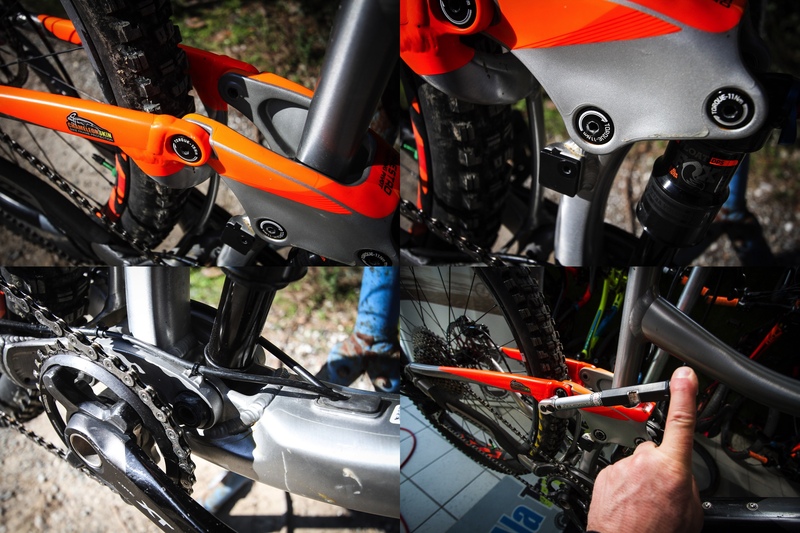 Taking a close look at the frame is important as it allows you to check all the various pivot hardware, and other parts of the bike, including the frame itself, making sure there are no cracks or other unseen surprises. We also take the opportunity to check our headset and make sure it is creak free and set correctly. 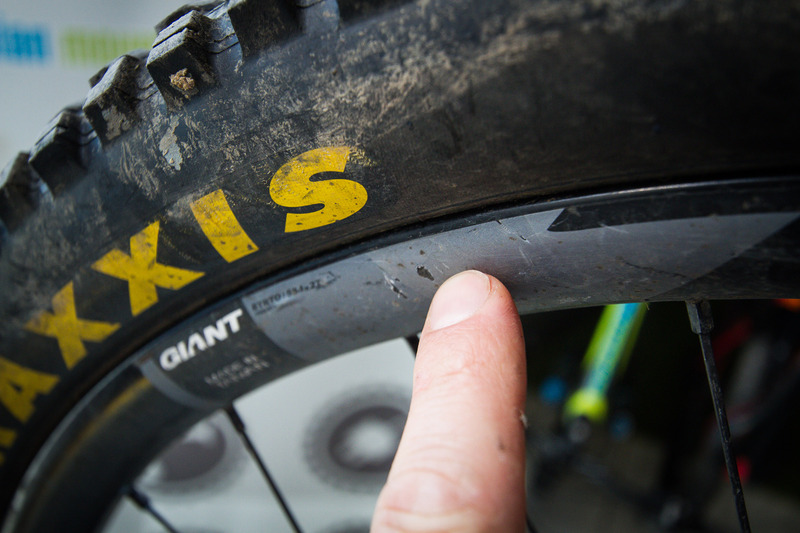 Check first around all frame lugs, to make sure there are no cracks or signs of stress, these could be fatal if pushing the limit of the bike. With the bike on the floor grab the front brake and rock the bike backwards and forwards to see if the headset is loose. 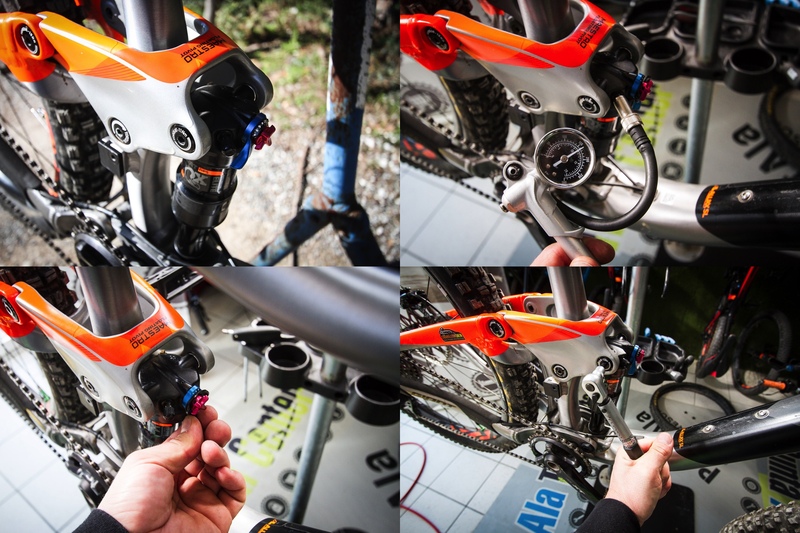 If so loosen the stem, tighten the headset preload and reset the stem. Check how straight the rear gear hanger is, it should be hanging vertically, at a later date we will show how to adjust these if they are bent. In this case ours is perfect and in good shape. Lastly, check all the rear suspension pivots for play and tightness. It is essential to use a torque wrench. 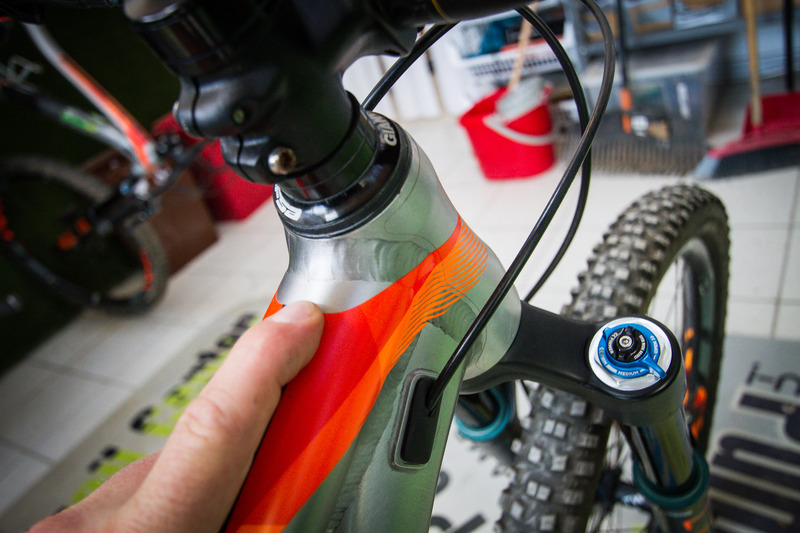 The fork and rear shock are essential and must be in good working order for a good ride experience. They take a lot of abuse on race trails and should be frequently maintained. We are not going to disassemble here this time, but we can make sure their pivots are snugged up correctly, the seals are not damaged and the sag settings are correct. 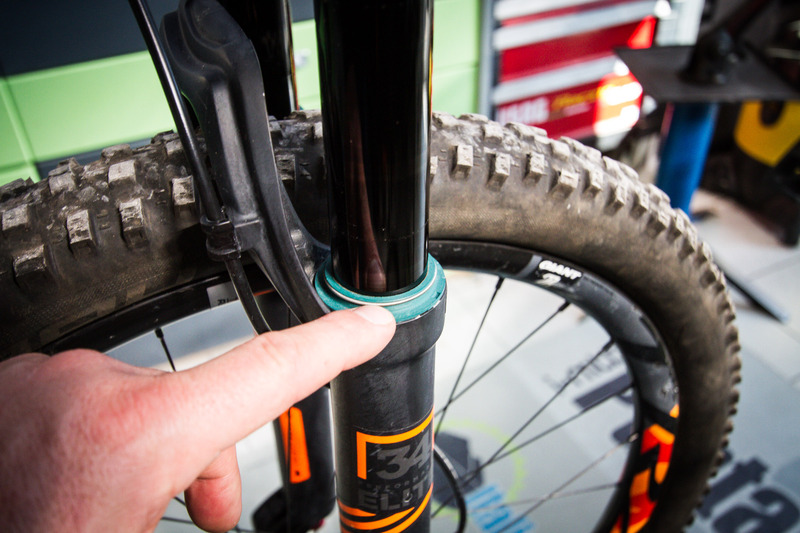 The rear shock needs a lot of attention here, firstly we check the pressure and set the sag, then we check that the lockout parts work correctly then we check the pivots are tight. The pivot bushings are wear items and need close attention and changing if they have any play in them. 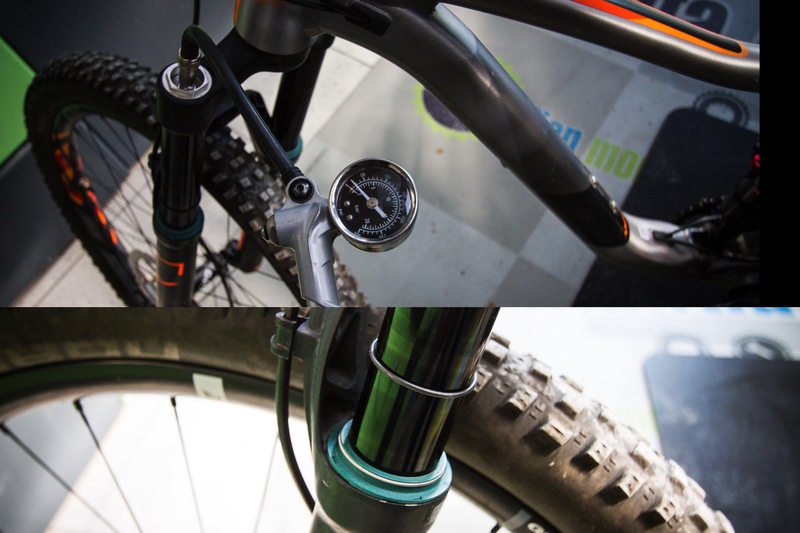 We check the front fork sag setting, here we are aiming for a 30 percent starting point. Air pressure is according to rider weight and style of riding. Aggressive riders tend to set their fork harder. Check the fork seals, ours are almost new. Ready to take some abuse! 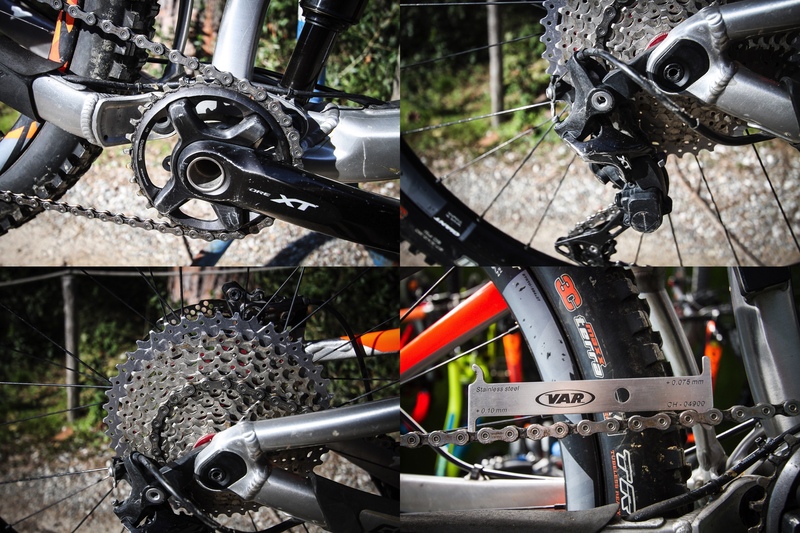 The bit that usually takes a lot of abuse and needs to work precisely is the drivetrain. 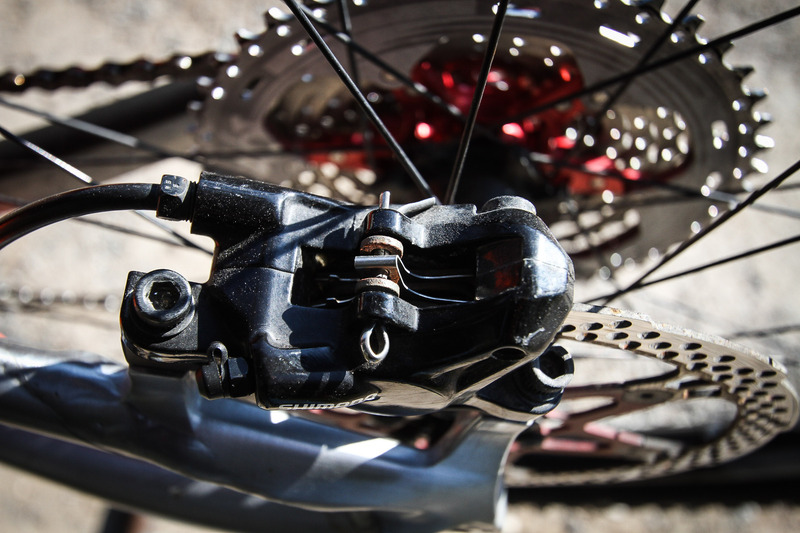 Get the gears set correctly and make sure the chain and drive parts are in good working order and not worn or broken. 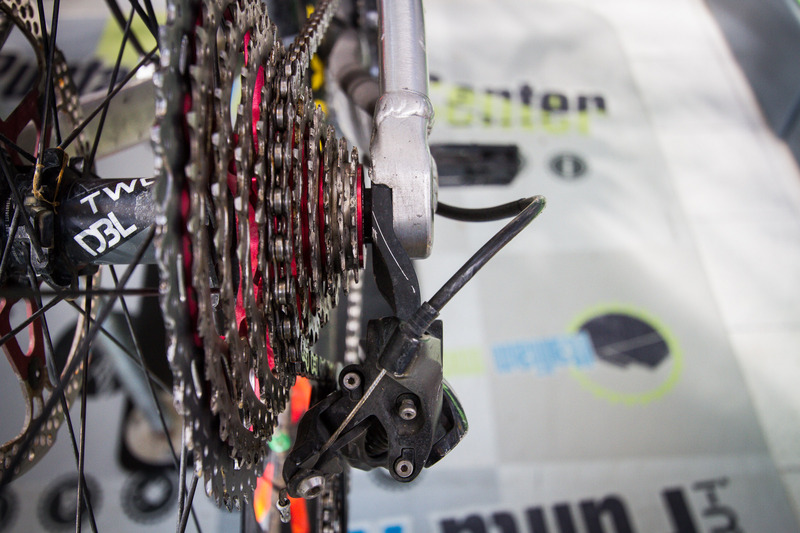 An unreliable drive train could end a race for you. 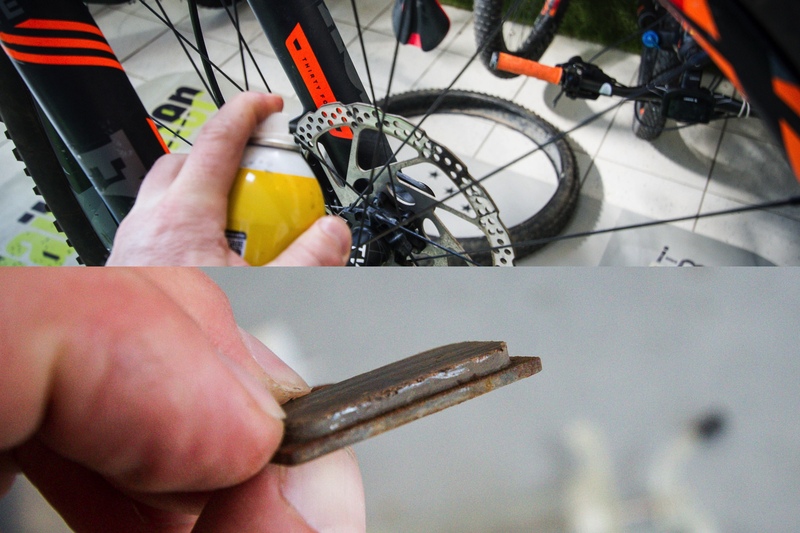 We take a close look at the chain and sprockets, all here are in good working order, our chain tool also shows us that the chain is still in optimum condition. We check and reset the gears using the barrel adjuster. (We will have a detailed article in the future on how to do this.) We also check the cable condition, no frayed cables please! 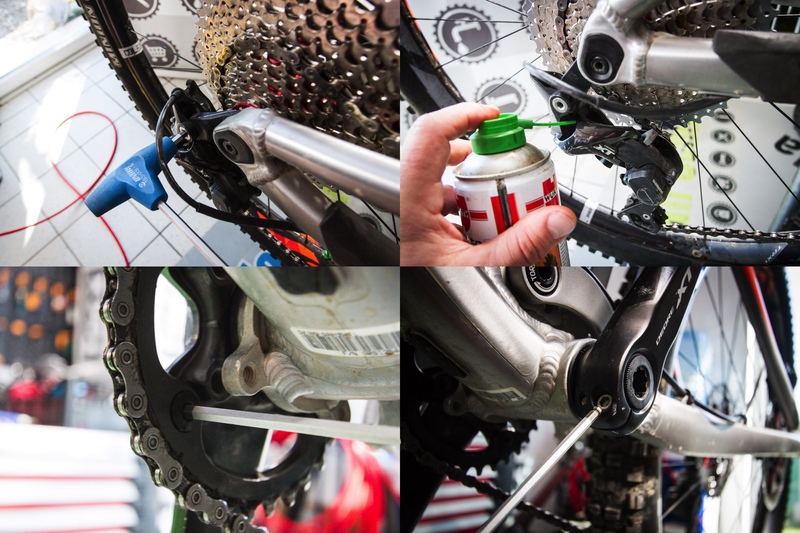 We check the derailleur bolt tightness and also give a quick spray of some non sticky pivot grease. 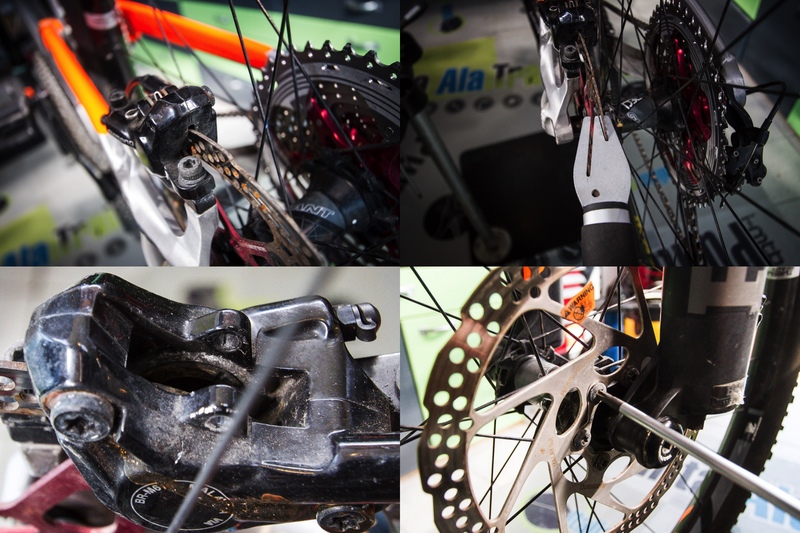 We also check the chainring bolts for tightness and the cranks. Everything should be smooth and without play for a precise ride feeling. Apart from riding fast we also need to stop. 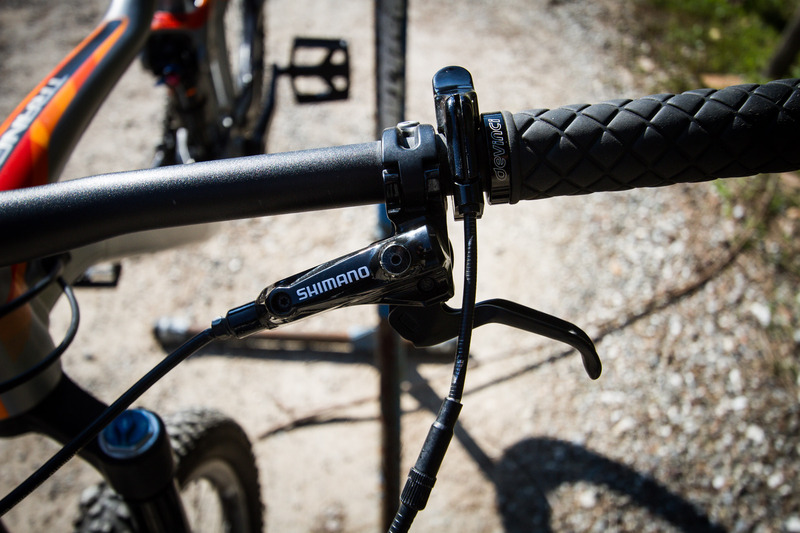 The brake system on most bikes varies, here our system is a Shimano Deore setup, simple but effective. 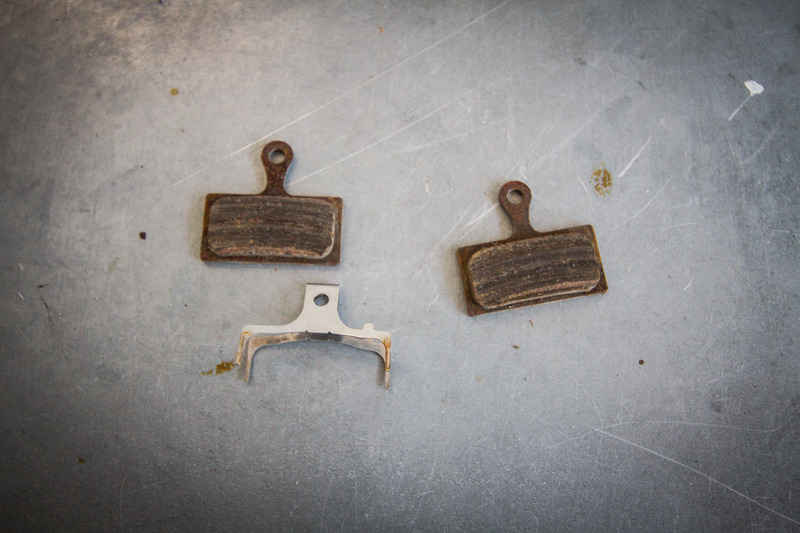 We checked the pads for wear, the levers for air in the system and also made sure the discs were clean and straight. Our calipers are single-piston versions, the brake levers have adjusters that require a hex key. The discs are fairly new and also in good condition. 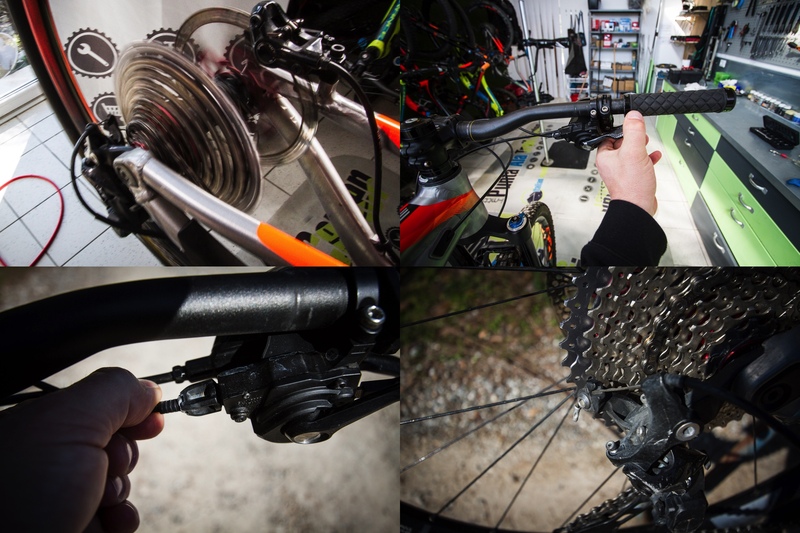 Ideally we should check for air in the system, with Shimano brakes this is a fairly quick and easy process, here we show a brief overview of how it’s done. 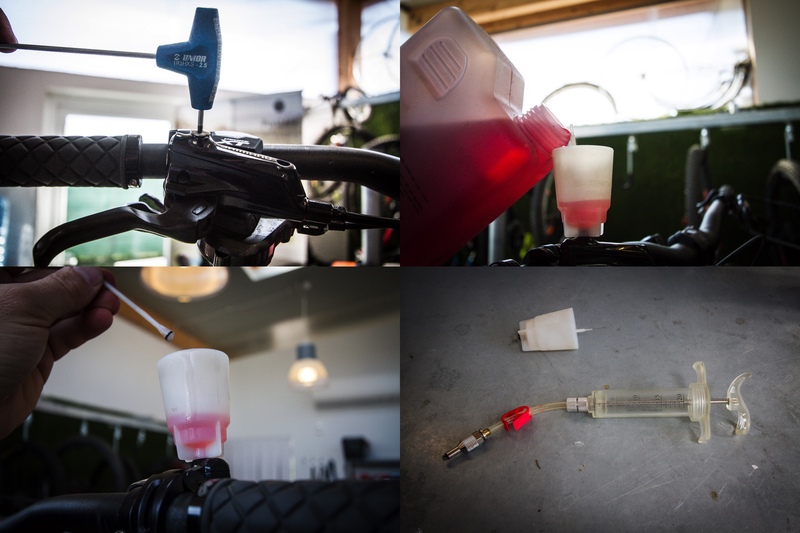 First we elevate the brake lever, then we use the special bleed cup and fill it half full, then allow the air to bubble up from the brake lever. The syringe pictured is for other brake systems. The pads are in perfect condition. We check pad thickness and give them a clean. We check the brake pistons for leaks and also the brake discs for straightness and reshape them where necessary. Our last major items to check are the wheels. Most wheels are of enough quality to remain fairly true, whatever you throw at them, however, spokes can work loose and rims need to be checked for spilts. 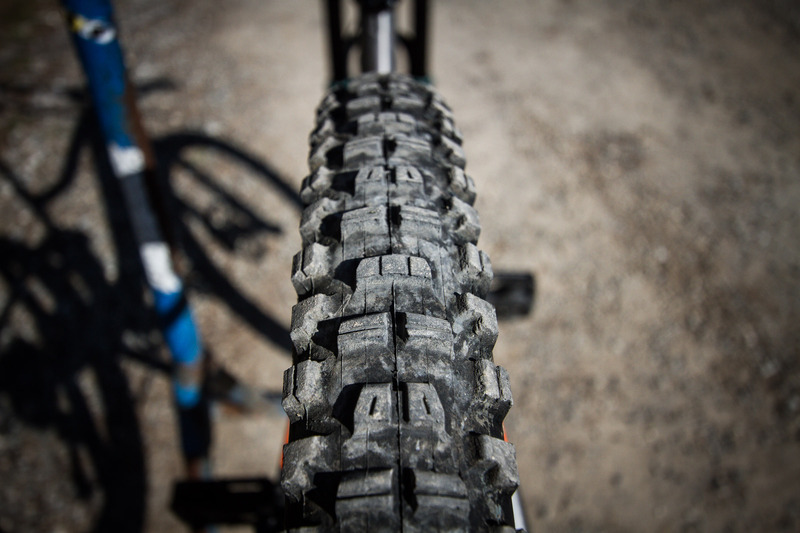 Plus tyres need to be in good enough condition to resist the trail that you are riding across. This tyre needs replacing if we want to race, cornering will be looser with out solid side blocks. This tyre is in great condition and is race ready. We remove the valve core, top up the latex sealant and check air pressures. Go around each rim to make sure they are all in good condition. No breaks or splits, any damage here could end your race. 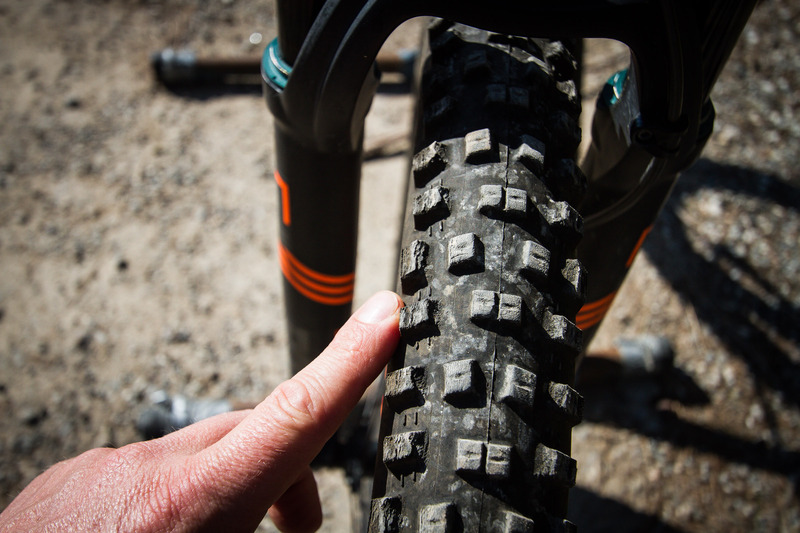 On each wheel grab a handful of spokes to check they are all without play and tensioned correctly, if loose tighten them a bit to make sure your wheel stays true no matter what you ride over, they should not creak and rattle. 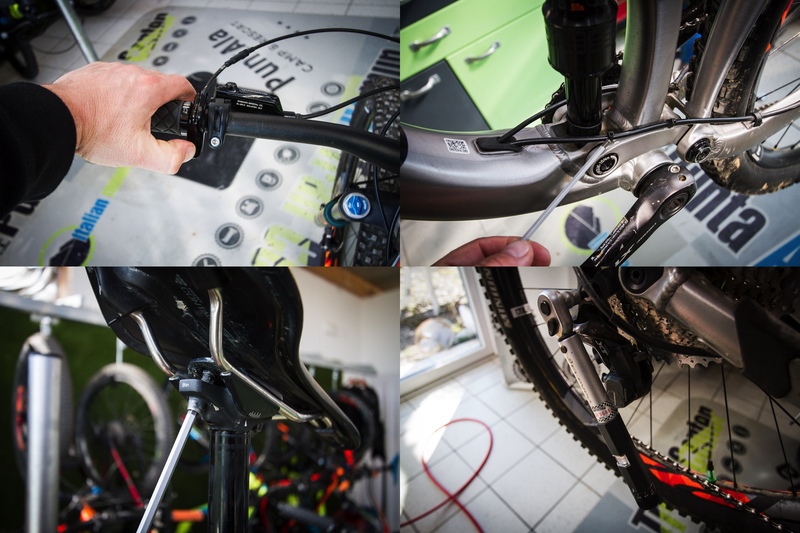 The last things to check include the seat post bolts, the action of the remote for the seat post and that all the cables are in the right place and tied down correctly. 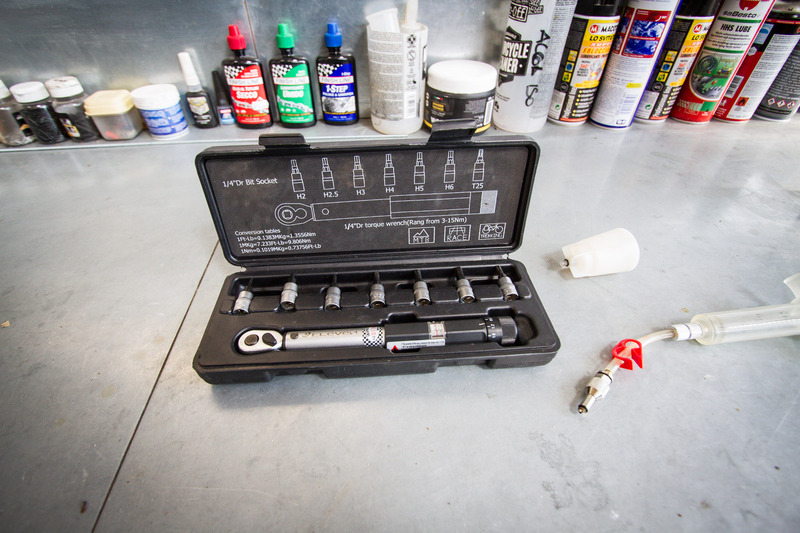 We the recommend one final pass with the torque wrench. In all we think that you need about two hours of time to do all these checks properly. 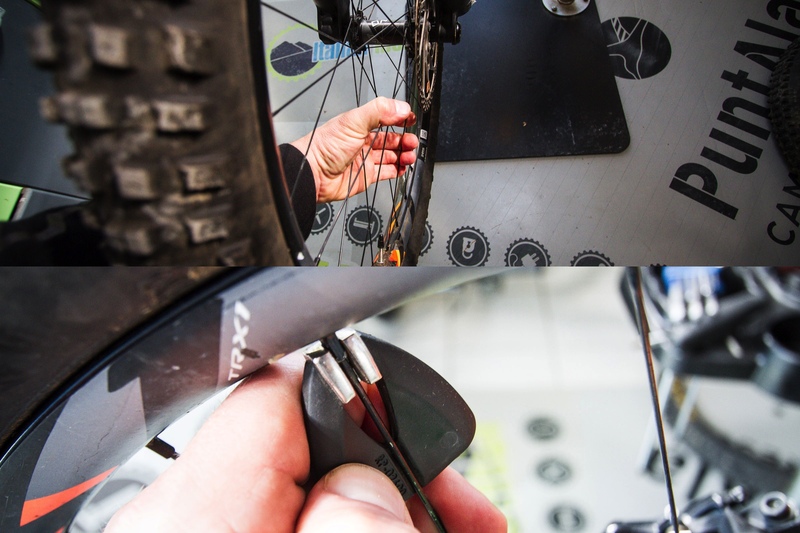 If you are unsure consult your local bike mechanic or drop into the trail center when you are here to ride, for any help and or service queries.